Dry and sour create a big one-two punch. I have only ever tasted a handful of brut IPAs, and so far have had mixed experiences. I get it: They're still relatively new, and we of the beer-loving mob have yet to give our collective blessing to this new and incredibly specific version of the India Pale Ale. This whole sub-style is, in a sense, a backlash in response to the overly hazy, turbid IPAs on the market. Brut IPAs aren't like other variations—full of malt sweetness and hops that can play off of each other without much effort. In my experience, alcohol doesn't seem to be such a huge factor in bruts. In fact, I think a lower ABV seems to prevent them from becoming overly dry and one-dimensional, making them a prime style for Utah's session-strength market. 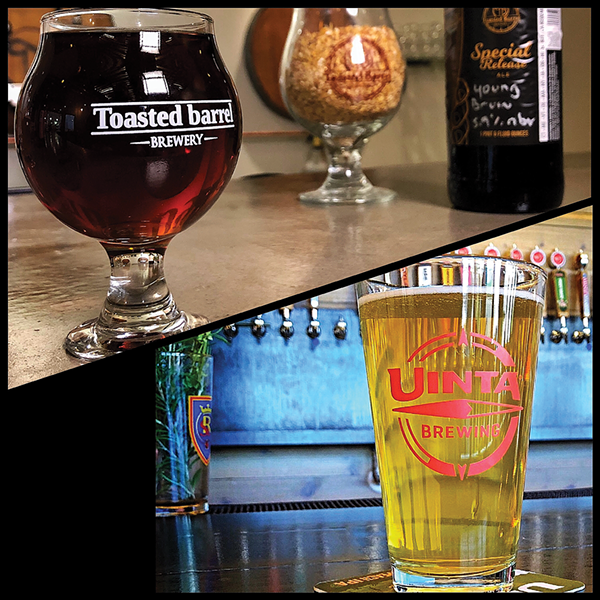 Uinta Brewing is the latest local brewery to emerge with one, and it seems to be right on time. Uinta Saddleback Brut IPA: Pouring intensely clear, it has an almost comical level of clarity. In fact, it looks like those fizzy yellow beers from the grocery store we spend so much time slamming. The nose has a striking characteristic of lemon and orange peel, with some of the nicer qualities of a fruitier West Coast IPA. The aromas are faint, but they do set you up for the palate. As it hits the tongue, it almost has a sake-like quality with some light florals and cantaloupe. There's a nice, light citrus spritz next that brings in a bit of IPA character; it's more of what I was hoping for. That being said, it's not fruity, and the bitterness in the finish seems to be enhanced by the prickly gas in the beer. Overall: There's a slight learning curve here that won't be hard to overcome. If you're a fan of Pilsners and light lagers, you'll adjust fairly quickly, but if you like your IPAs chewy, you'll have to spend a pint or two getting to know it. This 4-percent beer has just enough going for it to keep your mind and palate interested. Toasted Barrel Young Bruin: The Oud Bruin style of sour ale is one of the things in life that just makes me happy. I love the funky tartness and the dark fruity flavors that come from the malt. The Young Bruin from Toasted Barrel is not that beer, and I'm OK with that. Hell, it practically says it in the name: This is a less mature, faster-sprinting interpretation of the style. Appearance-wise, it looks the part: mahogany wood (mostly) with a tinge of ruby highlights. My interest is piqued as I get my nose down in there. It's a little sour, but mostly just lemon with a hint of cocoa, stone fruits and a touch of melon. Then the first sip shows off its soured ale—the lactic acidity full of tart lemon with hints of some malt sweetness. From here the brown ale begins to take over, adding toasted grains and a dose of vague nuttiness. Unexpectedly, some cocoa creeps in behind the other toasted qualities, adding a bit of dryness that seems to complement the barely noticeable hops. It finishes tart, with lemon and lactic acidity briefly carrying on into the aftertaste, which soon dries out this 5.8-percent beer. It's light in body, with middling carbonation levels that briskly prickle the tongue. Overall: If you're a fan of kettle sour or sour mash beers, this one should please you. There aren't too many breweries in our market doing dark sours. If I had to knock it, I'd say that I'd like to see a smidge more malt sweetness to really round it out and make it more of a "young adult" Bruin.